If you are exposed to nanoparticles, you might think they would move around inside your body unchanged. However, it would be more accurate to think of them as tiny chameleons, constantly changing their properties as they move from one biological environment to another. Nanoparticles’ large surface area-to-mass ratio, which causes them to be highly reactive, together with their tiny size, makes them great candidates for shuttling drug molecules into tissues and cells. But at the same time, this property also causes the nanoparticles to readily interact with their environment and, therefore, change their physical and chemical properties as they move from one environment to another. This chameleon-like feature makes it difficult to predict their behavior and impact inside distinct tissues and cells, or inside distinct subcellular structures, called organelles. This problem has become especially clear when scientists studied the impact of cerium dioxide (ceria) nanoparticles on living cells, where they found that these nanoparticles induced diverse biological effects, ranging from toxic to beneficial. How can one type of nanoparticle be both toxic and beneficial? Scientists believe these disparate effects might be due to distinct reactivity or chemical states of the nanoparticles in distinct environments both within and between cells. However, peeking inside living cells and organelles to determine the chemical state of nanoparticles is very difficult, so this explanation has not been confirmed. To establish realistic relationships between the chemical state of the nanoparticles and their impact on the cell, we need a way to measure the chemical states of nanoparticles inside intact, hydrated living cells. We and other research groups have been trying to address this challenge by looking for methods that would allow us to peek inside living cells and organelles and gather information about nanoparticle properties. 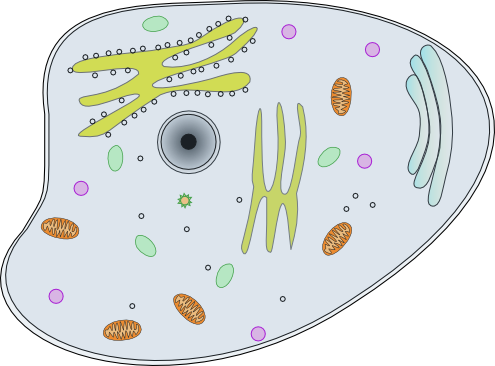 One such method consists of a unique microscope that uses x-rays to provide chemical images of the nanoparticles inside intact hydrated cells and organelles. Using a powerful microscope and x-rays generated by the synchrotron at the Advance Light Source at Lawrence Berkeley National Lab, we have been able to identify the chemical or oxidation state of the nanoparticles inside lung cells known as alveolar epithelial cells, with incredible 10 nm spatial resolution. By comparing the chemical state of the nanoparticles inside the cell with the state of nanoparticles outside the cell, we found that, indeed, the nanoparticles changed their chemical properties as they entered the cell. We further overlaid these images with images obtained using super resolution fluorescence microscopy, in which distinct organelles were highlighted by distinct fluorescent probes. This approach allowed us to determine the reactivity or oxidation state of individual nanoparticles inside distinct organelles and understand how the properties of nanoparticles change depending on exactly where they are inside the cell. Together with toxicity studies, this allows us to predict the impact of the nanoparticles on the cells and ultimately on human health. Another approach that allows us to gain insight into nanoparticle properties inside cells and organelles uses molecules that become fluorescent once they interact with specific molecules or ions that might be shed by the nanoparticles. This approach can tell us, for example, whether a nanoparticle becomes partially or fully dissolved inside certain organelles. When nanoparticles fall apart like this, it can often cause harm to cells. An image of a cell, outlined by the dashed line, showing endosomes in red, and vesicles containing zinc ions in green. 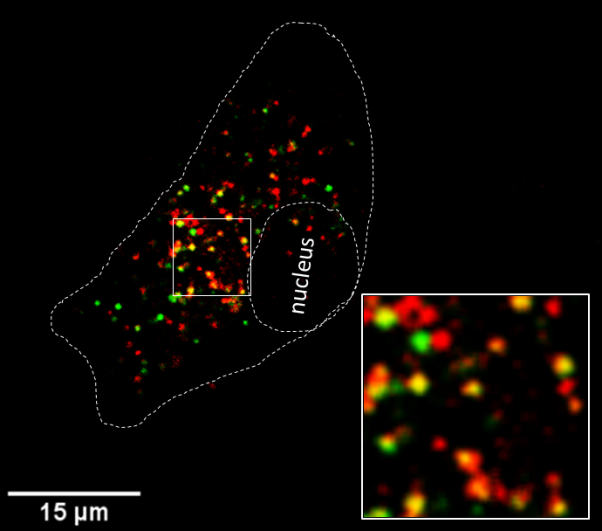 Yellow shows up whenever the red and green overlap, telling us that the zinc ions are found in the endosomes. The area marked by the square is enlarged in the image on the lower right corner. Image via Cosmin et al., Nanotoxicology, 2013. Reproduced with permission of Informa Healthcare. Using this approach, we studied the dissolution of airborne zinc oxide nanoparticles inside alveolar epithelial cells. In order to more fully mimic the effects of inhaled zinc oxide nanoparticles, we grew these lung cells with their upper surface exposed to air, just like they grow in the lung. We detected the dissolution of zinc oxide nanoparticles using a highly sensitive indicator that becomes fluorescent in the presence of zinc ions, known as FluoZin 3. We found that these nanoparticles start to dissolve as soon as they enter the cell carried inside small sub-cellular bubbles or vesicles, known as endosomes. They continue to dissolve as they are shuttled from one type of vesicle to another until they reach the final degradation vesicles, or lysosomes. We also found that very little dissolution of the nanoparticles inside these vesicles causes high levels of toxicity. These are just two examples for methods that researchers use to peek inside living cells and organelles and tell us about the chemical and physical properties of nanoparticles. We are motivated to do this work so we can identify properties that make a nanoparticle toxic or biocompatible.